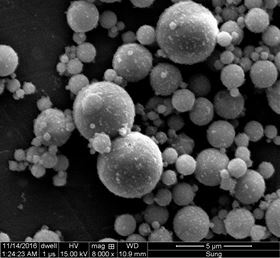 This scanning electron microscope image shows spherical particles in the type C fly ash used by Rice University researchers to make a cement-less binder for concrete. Image: Multiscale Materials Laboratory/Rice University. Researchers at Rice University have developed a composite binder made primarily of fly ash, a by-product of coal-fired power plants, that can replace Portland cement in concrete. The material is cementless and environmentally friendly, according to Rice materials scientist Rouzbeh Shahsavari, who developed it with graduate student Sung Hoon Hwang. Fly ash binder does not require the high-temperature processing of Portland cement, yet tests showed it has the same compressive strength after seven days of curing. It also requires only a small fraction of the sodium-based activation chemicals used to harden Portland cement. The researchers report their results in a paper in the Journal of the American Ceramic Society. More than 20 billion tons of concrete are produced around the world every year in a manufacturing process that accounts for 5–10% of global carbon dioxide emissions, surpassed only by transportation and energy as the largest producers of the greenhouse gas. Manufacturers often use a small amount of silicon- and aluminum-rich fly ash as a supplement to Portland cement in concrete. "The industry typically mixes 5% to 20% fly ash into cement to make it green, but a significant portion of the mix is still cement," said Shahsavari, an assistant professor of civil and environmental engineering and of materials science and nanoengineering. Previous attempts to entirely replace Portland cement with a fly ash compound required large amounts of expensive sodium-based activators that negate the environmental benefits. "And in the end, it was more expensive than cement," Shahsavari said. So the researchers used Taguchi analysis, a statistical method developed to narrow the large phase space – all the possible states – of a chemical composition, followed by computational optimization, to identify the best mixing strategies. According to Shahsavari, this greatly improved the structural and mechanical qualities of the synthesized composites, and led to an optimal balance of calcium-rich fly ash, nanosilica and calcium oxide, with less than 5% of a sodium-based activator.